Our main business priority is to provide the highest quality products and solutions perfectly suited to the needs and expectations of our customers in terms of technical parameters. We focus on what is most important to our Contractors, building long-term relationships with them, based on an individual approach to each of them. Realization of even the most complicated and demanding orders has become not only our mission, but also the trademark of the INTERkrąż brand. We also do not forget about other aspects of our activity, which are so important not only from the business, but also from the social point of view. In accordance with the responsible policy of our company and clearly defined requirements of the European Union, we implement and use only production and technological lines that are fully environmentally friendly. For years we have been using a system that allows for almost 100% recovery of raw materials, and the production process itself does not release any hazardous volatile agents into the atmosphere. After more than 30 years of activity we are still hungry for new solutions and projects that seem impossible at first sight, and the challenges that market reality poses to us are grist for the mill for our R&D and production departments. The bar is constantly moving upwards, pushing us towards new directions of development and improvement of the product range. 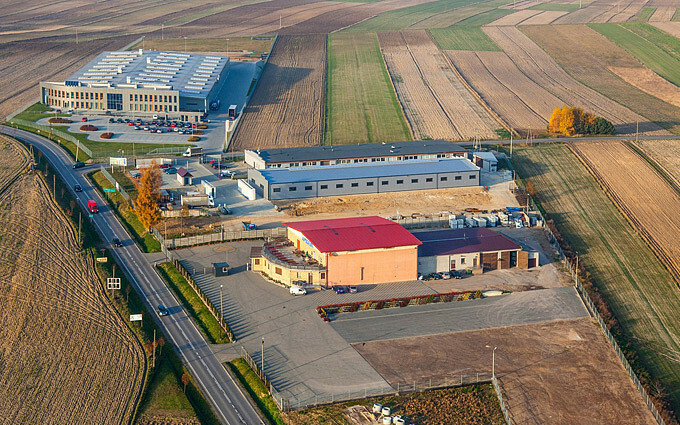 The superior goal of the INTERkrąż brand is undoubtedly the Customer's satisfaction through continuous development and improvement of products, expanding the assortment offer, improving the quality of components, and implementing innovative production solutions aimed for improving and increasing the efficiency of our Contractors companies. Our goal is to support the operation of underground and open-pit mines, companies involved in extraction and processing of mineral materials and raw materials, seaports, airports, or warehouses and sorting plants. We are constantly striving to reinforce the position of our brand and increase its market share not only in Poland, but also worldwide. What drives the market power of the INTERkrąż brand is the systematically growing production capacity and the level of sales of our products, which rises year by year, as well as the constantly growing customer base, with most of whom we cooperate on a permanent, long-term basis. From the very beginning of our activity we have been making every effort to ensure that the image of the INTERkrąż brand in the eyes of our customers was the best possible. The company strategy is based upon long-term relations with customers, and we see the key to success in contacts in an individual approach to the needs of each of them. at each stage of cooperation. We are aware of and perfectly understand the fact that the success of projects realized by our customers depends on the reliability of our company and the quality of our products. Cooperating with the best suppliers of raw materials we guarantee the highest durability of our assortment. We are distinguished not only by the high quality and the ability to adjust technical parameters to the needs of our customers, but also by reliability in terms of on-time delivery of the components ordered by them. The highest quality of INTERkrąż products has been confirmed by the certification of the Central Mining Institute in Katowice.